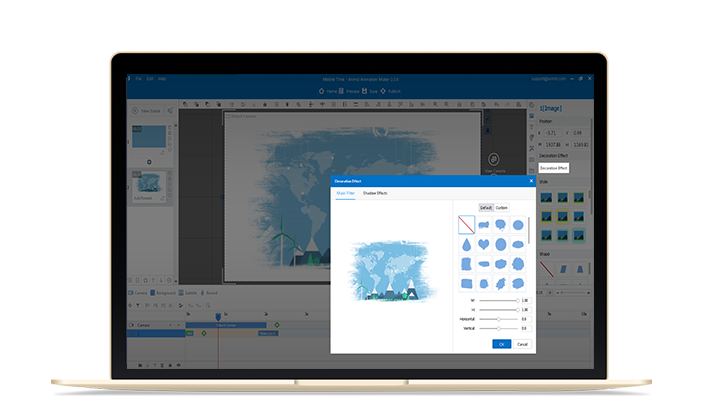 As for new beginners, this multimedia animation software offers a simplest way to start an animation video. Firstly, prepare your contents with PowerPoint, and then you are allowed to import the file (*pptx) into Animiz, which would be automatically turned into an Animiz project. Secondly, the other way to start your animation video is to open a pre-designed template to further modify it. Finally just publish the Animiz project as video format. It is also simple to add multimedia for your video. 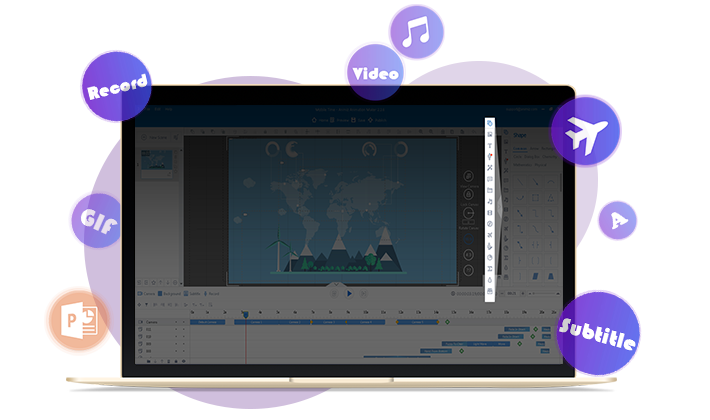 Animiz allows add various kinds of multimedia to decorate the video. The most common are music, shape, image, symbol and vector images which can satisfy your basic needs for a video. Furthermore, other multimedia like Callout, Formula, SWF and Label are also available for you if needed. Combine all the multimedia into a video to make it much more plentiful and informative. Here is an amazing function in Animiz – decoration effect for video and image. After image and video being added, there is an option for you to choose. You can go further to decorate the video and image. There are more than 50 kinds of effects for you to choose from. So easy to you’re your video or image become the shape you need. What’s more, you can customize the video and image effects through import a shape or an image. In this way, your video or image should be different from others which make it easier to catch audiences’ attention. You have no need to be so professional or so brilliant to design some animation effects. Animiz do this for you. 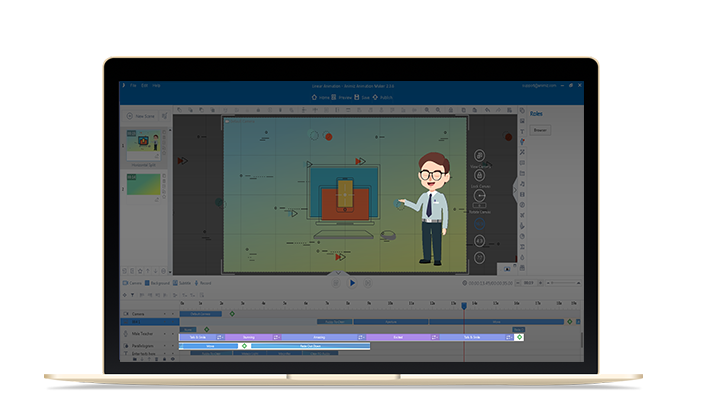 With this interactive animation maker, you can easily create the animation you want. 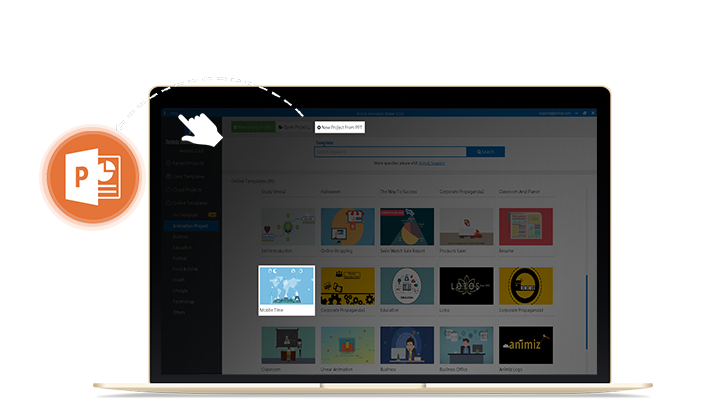 Firstly, you can choose to add some built-in animated roles with rich expressions and different actions for the video. Compare with callouts to make a role-play dialogue. Secondly, you can add animation effects for the object you like with the help of the Timeline. Gives the static objects the animated effects and add vividness to the video. Give your video vividness with the dynamic roles and animation effects.